Sometimes, it’s hard to improve on a classic, but other times, a character’s original design isn’t the best. Hawk (then a colonel) was first released in 1982 alongside the rest of his team as the operator of the Mobile Missile System. However, due to a combination of being a vehicle driver and sharing a lot of his look with the other Joes, that version of Hawk was fairly uninteresting. 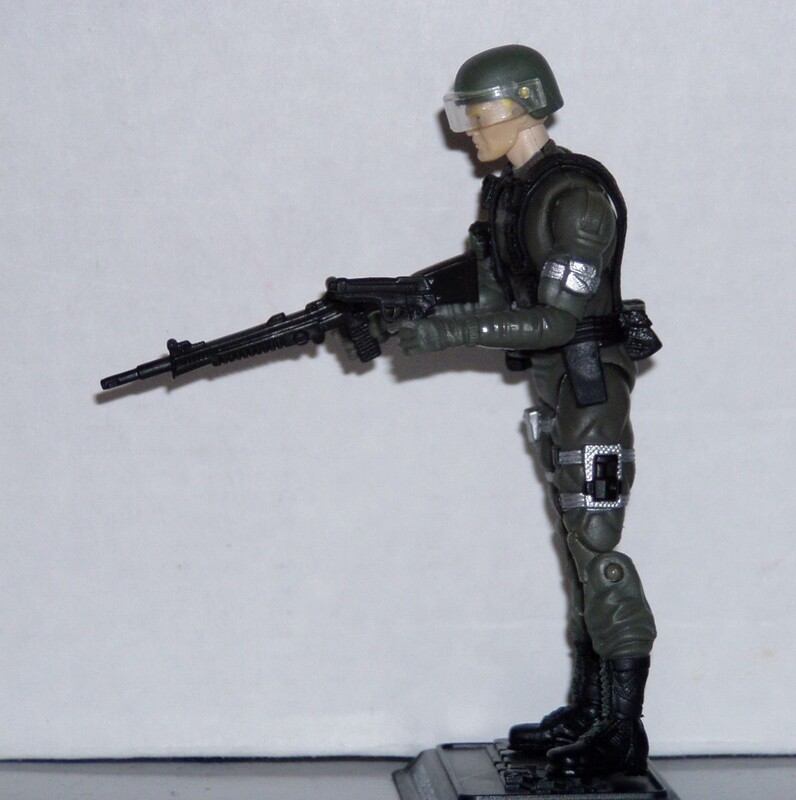 Heck, it was such a non-entity in most Joe media that I was familiar with growing up that I didn’t even know about the 1982 Hawk figure until I was in high school, wandering through YoJoe.com’s figure database. Though it may not have been his iconic look, Hasbro tapped Colonel Hawk for inclusion in the first wave of 25th Anniversary comic packs. That makes a lot of sense because it’s an easy figure to recreate and the first wave of comic packs were all pretty simple since Hasbro didn’t expect the 25th Anniversary line to take off the way it did. While I still prefer the later General Hawk look, it’s hard to fault Hasbro for giving us Colonel Hawk’s look first. Like the rest of the Original 13, Colonel Hawk shared a lot of parts with the other Joes released at the time. The same is true for the 25th Anniversary version. From the neck down, this figure uses the 25th Anniversary Snake Eyes parts, though it’s a late enough use of those parts that he’s not afflicted with diaper crotch. 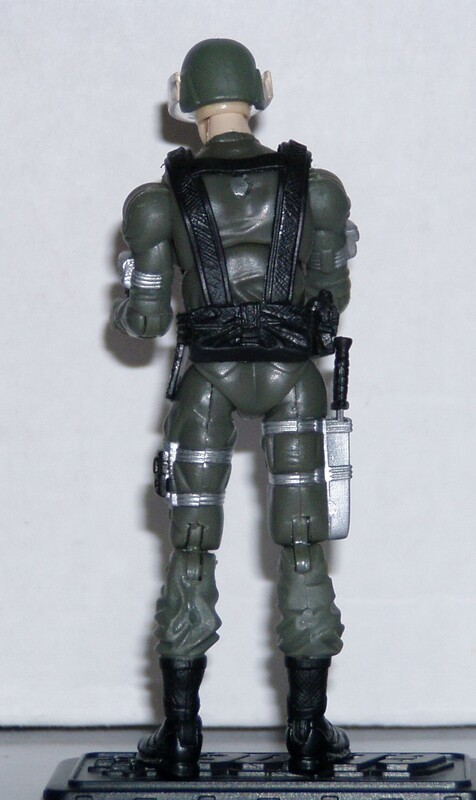 The 25th Anniversary Snake Eyes mold was one of the more effective early 25th Anniversary figures. The proportions are solid and the webgear helps minimize the appearance of his torso gap. I also appreciate that Colonel Hawk wears the same uniform as the rest of his soldiers. Since he’s a colonel, that probably means he’s the highest ranking Joe out in the field, but he’s going to be in the field more regularly, so he needs more battle-ready gear. 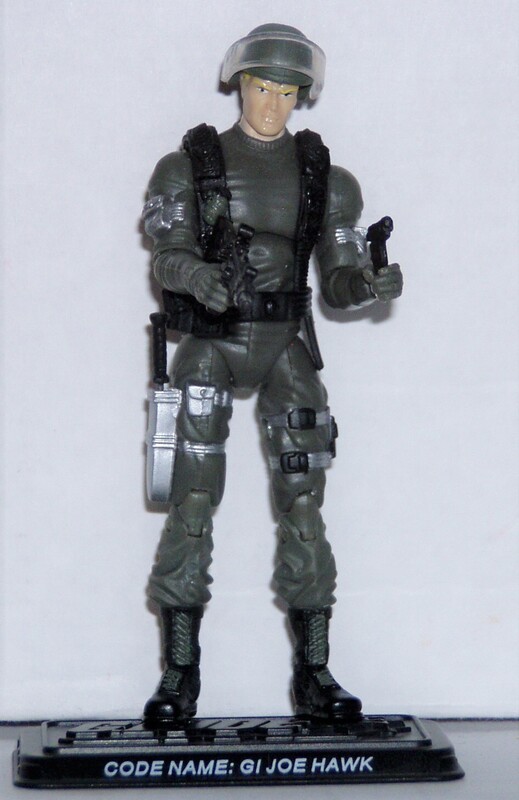 The 25th Anniversary Snake Eyes webgear is a solid piece and it accurately reflects the vintage figure. It fits the figure very well and adds a little more visual weight to the rather basic jumpsuit he’s wearing. Up top, 25th Anniversary Colonel Hawk gets what I believe is the only new piece from the first round of 25th Anniversary comic packs. The new head is great, though it does look to be just a little on the small side. It’s not as tiny as 25th Anniversary Wild Bill’s head, but without his helmet on, Colonel Hawk looks a bit pinheaded. This is a very different look than the one I’m used to for Hawk. I’m not sure if that’s good or bad, but this is a very significant departure from the look I’m familiar with. 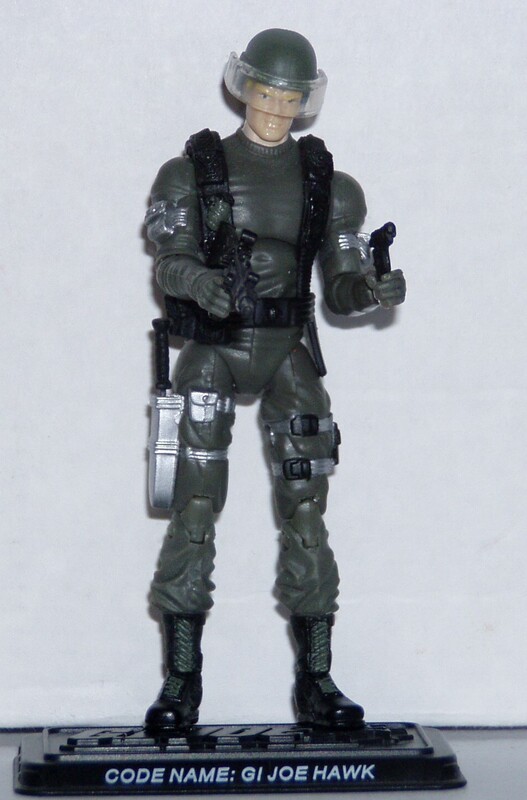 I like that Hawk looks a bit older than the rest of the Joes, but I think while the 25th Anniversary General Hawk figure may have skewed a bit too young, the 25th Anniversary Colonel Hawk skews a tad too old. I like that Colonel Hawk’s face has some character and looks like a military operator who’s seen some stuff during his career, but he still looks a little more like a man who’s at the end of his military career rather than someone who’s got enough experience to lead a new team but will be around to lead them for a while. Like the vintage figure, 25th Anniversary Colonel Hawk’s paint work is also fairly simple, but it’s unique to him and that helps make him stand out a bit more. 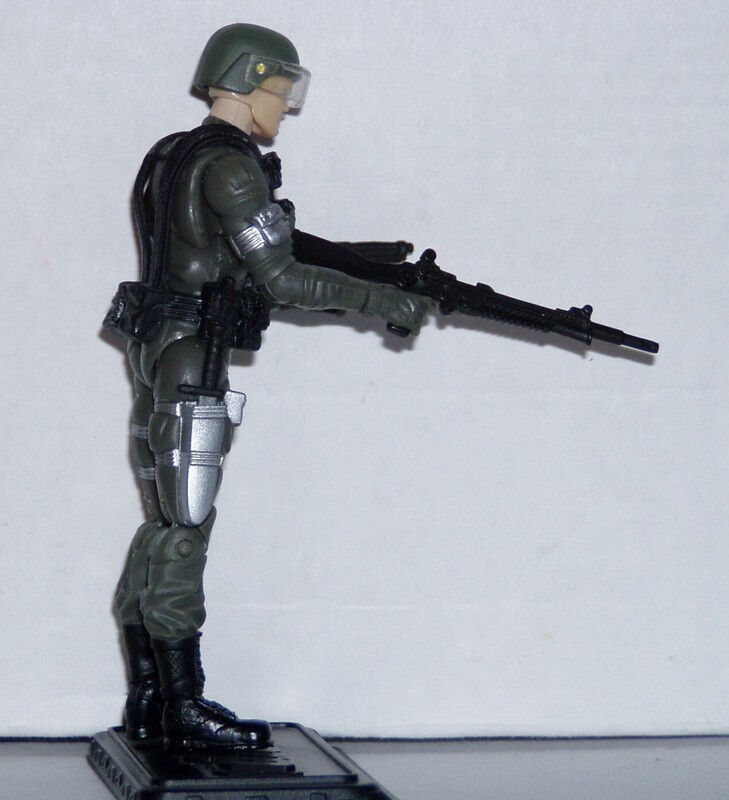 The figure is molded primarily out of olive drab green plastic. It’s a nice, basic military look and it fits Colonel Hawk well. To make him stand out a little more, all the straps (save the webgear) are done up in silver. It pops nicely against the actual figure and evokes the vintage look quite well. Colonel Hawk’s head is molded from flesh colored plastic and his blonde hair is painted on quite well. The short hair looks good in blonde and the yellow contrasts surprisingly well against the molded flesh colored plastic. The look is basic, but it’s just like the vintage figure and it’s a great representation of the classic version of Colonel Hawk. 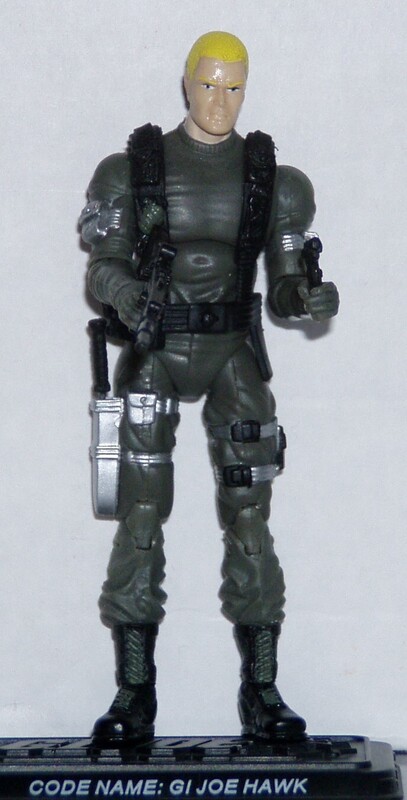 Colonel Hawk’s gear is also fairly basic, but it works well for the figure. Colonel Hawk’s primary weapon is the great 25th Anniversary Snow Job rifle. It’s not something I’d initially think to pair with Colonel Hawk, but it looks nice in his hands. Plus, the Snow Job rifle is a great piece, so I’m fine seeing it show up with Colonel Hawk as well. To fill the sheath on his leg, he’s got the standard 25th Anniversary Snake Eyes knife and there’s a 25th Anniversary Snake Eyes pistol to fill the holster. The pieces are simple yet effective. Colonel Hawk also gets a helmet, something we didn’t see too much in the 25th Anniversary line. It’s the basic Joe helmet and visor combination but it still works. It fits on Hawk’s head fairly well, which couldn’t be said for every figure that this piece came with. Though I wasn’t familiar with the 1982 version of Hawk until getting this figure, I have to say, I’m impressed. Hawk’s original look was pretty basic, but that worked for that time in the Joe brand. I’ll admit, what surprised me most about this figure was that this was the version of Hawk Hasbro gave us first. The new head and paint job help him look unique but it’s still clear he’s wearing a lot of the same gear as the rest of the Joes and I like seeing that in my Joes since they are a military unit. Don’t get me wrong, I’m glad Hasbro made a 25th Anniversary figure based on Hawk’s 1986 look, but it’s nice that Hawk’s first look also got some attention for a change. But 25th figs still have more articulation than vintage. The wrist joint alone is worth the upgrade. I would still like to see the original 13 plus Gen Flagg as a box set, or two box set, all with updated and UNIQUE sculpting. The 25th is a good starting point for this idea. But they desperately need new and better head sculpts for Grunt, Grand Slam, short Fuze, Flash, Breaker, Hak, and Steeler! Also each fig should have an M-16 to complement their signature weapon. LETS PUT SOME YO! BACK IN JOE!!!! I picked this Hawk up at a church rummage sale, missing his gear and his hands. I suppose Marauder Inc hands might work, if I want to fix him? (I pose that as question no one will answer).